Comparison Companies were chosen by their status as strong competitors to their counterpart Visionary Company, those who did not have the same track record of success. 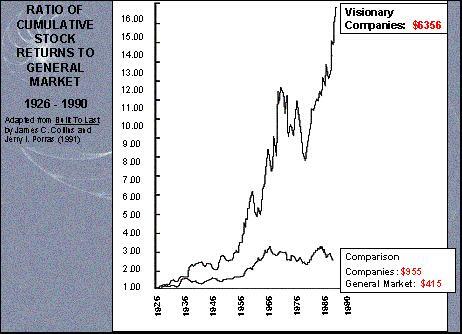 *Return on $1 invested from 1926 to 1990. What characterized visionary companies in terms of organizational culture? Rather than individual leaders, corporate culture is what carried them through business change and adversity. These companies had an uncanny ability to adapt to change. They were also crystal clear about what they were in business to do and what they stood for. It was not one great breakthrough idea, but their ability to execute business strategy through experimentation, opportunism, trial, and error.